This entry was posted in adopting kittens, Cat adoptions, cat behavior, Cat blogs, Cat Health, Cat writers, Cat Writers Muse Award winning blog, cats, Pet blogging, Siamese cats, Top 50 Cat Bloggers, Walk Through the Web Wednesdays and tagged British library cats on the page, casts in literature., cat tongues, cats drinking from faucets, Christmas cat in Reykjavík, high speed video of cat tongues, parasol Christmas tree for cat lovers, Yule cat by Feline Opines. Bookmark the permalink. First, i am sorry your humans came home smelling of puppy. The fact is, they probably went to visit family, and they have no control over the taste of said family, and it might, unfortunately, run to dogs. If they want to see said family, they have to put up with it. That doesn’t mean they like it any more than you do. 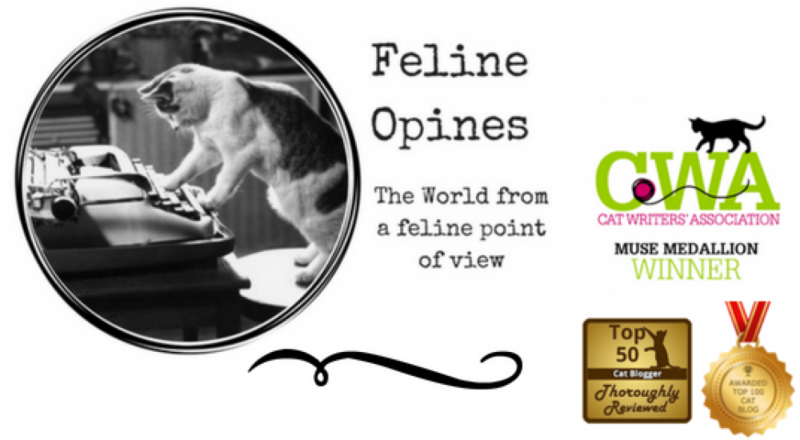 A cat literary display, it’s about time! That’s a great tree, they need to figure out how to export it. That Christmas cat story is an affront to all felines. Of course cats are better at washing themselves than we are. Only if a cat is caked in mud or stuff s/he doesn’t want to lick should the humans help, and then only so far as needed to get the offending substance off. We have faucet drinkers, too, and i have no idea why this particular cat is getting so much attention for it. Thank you, we’ve calmed down a bit over the puppy smell and you do make some rational points. I agree on the cats and literature , long overdue. And the cat washing article-duh! All you have to do is look at Oliver’s pristine white coat and anyone could come to that conclusion (and you done need to be a scientist to do it). Mrs. Tabitha’s Cats Academy is adorable. I’ve always had faucet drinkers. I didn’t think that was something unusual. Oh well, what do I know. That tree wouldn’t be any fun at all but that’s probably the point MOL! I’ve heard the Icelandic story of the horrible cat, but in general, they LOVE cats in Iceland. I kinda like that statue, but I do NOT like continuing monster cat stories. You guys always find the coolest stuff across the web! I don’t know what makes a video go viral but I suspect Facebook and Instagram have a lot to do with it. Maybe if you hang upside down while drinking water you’ll get your 38,000 views! I know I’ve posted to your blog before, maybe using a WordPress account. But today, nothing correct works. So you’ll get an odd email notification from me today I bet. So sorry it took me so much time to respond. Our Purrsonal Assistant has been dealing with some purrsonal issues and unfortunately, this has effected her work product. Still. we love her and it'[s hard to get good help these days so we hope you will forgive my late response. By the way, I like the drinking water upside down idea! Oh yes, the level of service from the publicity department is sorely lacking. I thought for sure I’d be famous by now!